Neudorf was among the villages in Banat that were allowed to keep their German name after World War I. In the peace settlements the area went to the Kingdom of Romania. Many village then received a new Romanian name. 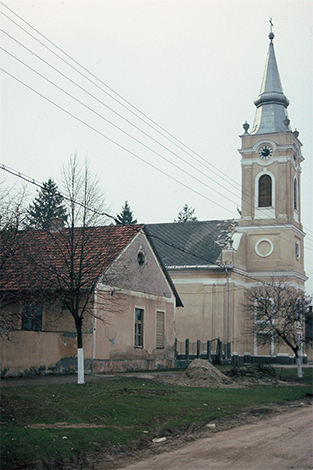 The German settlers, who had come to the Region in the 18th century, resettled in the Serbian village of Novoselo and changed its name to Neudorf. The attraction of Neudorf is its Roman-Catholic church which is the eternal resting place of archduchess Maria Anna Ferdinand (1770-1809). She was the daughter of archduke Leopold who later became Emperor Leopold II. As she had ill lungs, she came to the region of Neudorf in 1809 for rehabilitation. She died the same year from tuberculosis. Due to the ongoing war, her body could not be brought to Vienna and she was entombed in Neudorf. 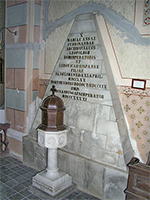 Her tomb rests under the church’s altar in a crypt. Next to the altar, a memorial commemorated the Habsburg duchess who was born in Florence and died in Neudorf. The church clock is a further attraction of Neudorf. It was produced in the famous Manhard Factory in munch in 1882. Its mechanics still work today. 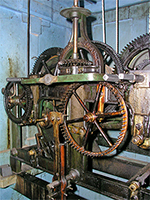 RIGHT: Church clock from 1882, produced in the Manhard Clock Factory.